ColletionDX owner JoshB surprised me with a really honest review of my first E.killer toy over at CollectionDX, and you should check it out! 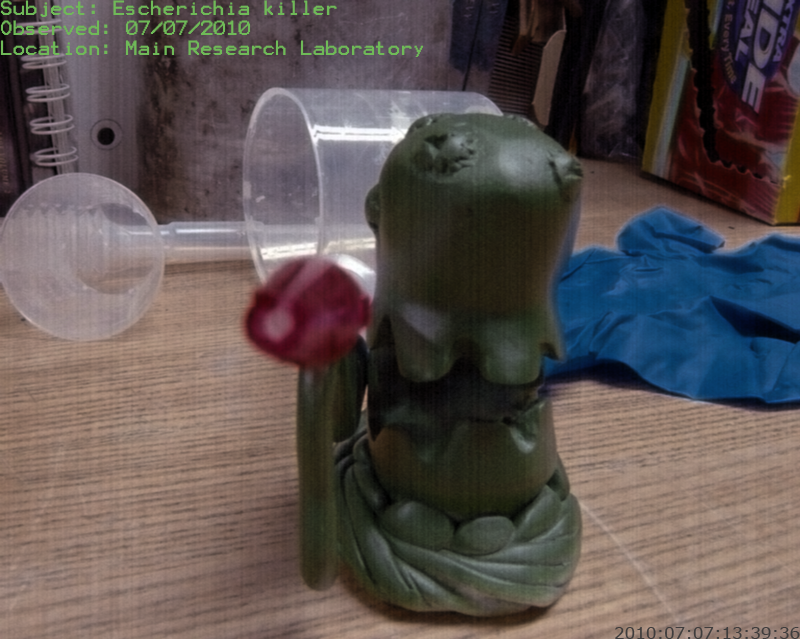 It’s great to get some really blunt feedback, and I’m incorporating a fix for the biggest complaint into the upcoming E.killer v.2, the base. 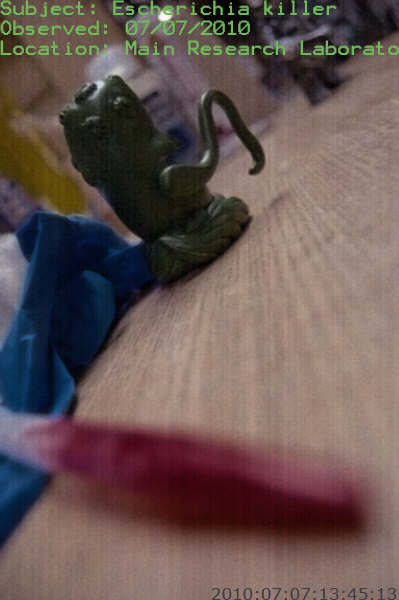 Look for some news on new figures soon. I am going to spend the weekend pouring molds, and should hopefully have something real to show soon! Just wanted to post a reminder that Sunday was E-day… the first wave of E.killers goes on sale at 8PM EST on SATURDAY the 31st. Along with the first wave of killers will be some choice vinyl customs from the past couple months for sale. Make sure to check the Shop for everything that goes up! EDIT: the 31st is Saturday, as I said below, now Sunday as I said above. The release will be Saturday. The big news starts here! 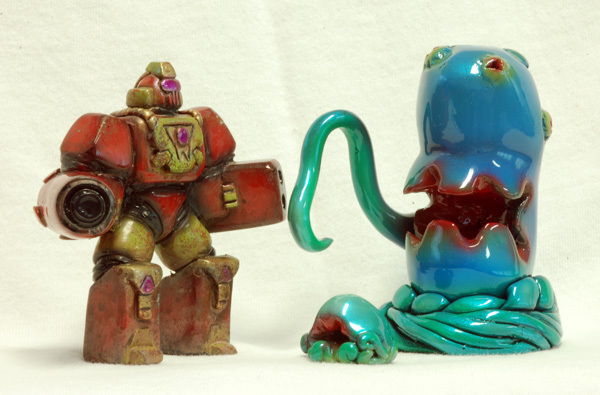 Introducing the Killer Culture line of resin figures! In 2010, the esteemed Dr. Hayflick was experimenting with macrocellularification, an experimental technique for making normally microscopic specimens large enough to be analyzed using the naked eye. Using highly unstable ATP-X, Dr. Hayflick was able to grow individual cells that were up to two or three inches in diameter for analysis. 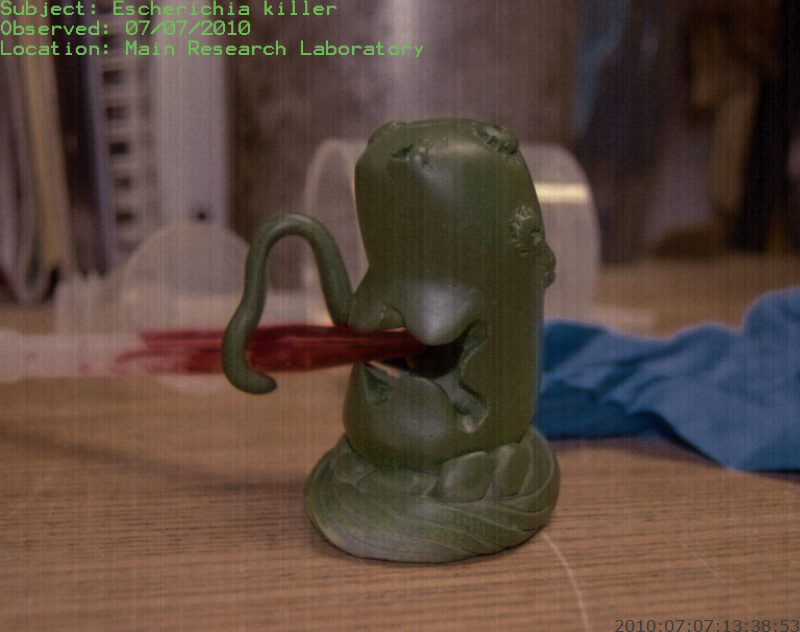 What happened next is still under investigation, but early reports indicate that a mutagen experiment elsewhere in the facility suffered some complications, and an experimental mutagen leaked into the ventilation system at the same time that a major breakthrough in Dr. Hayflick’s work was expected. The facility was destroyed in the aftermath of what happened next, with Dr. Hayflick still unaccounted for, but the world now faces a deadly new menace, the Killer Cultures! 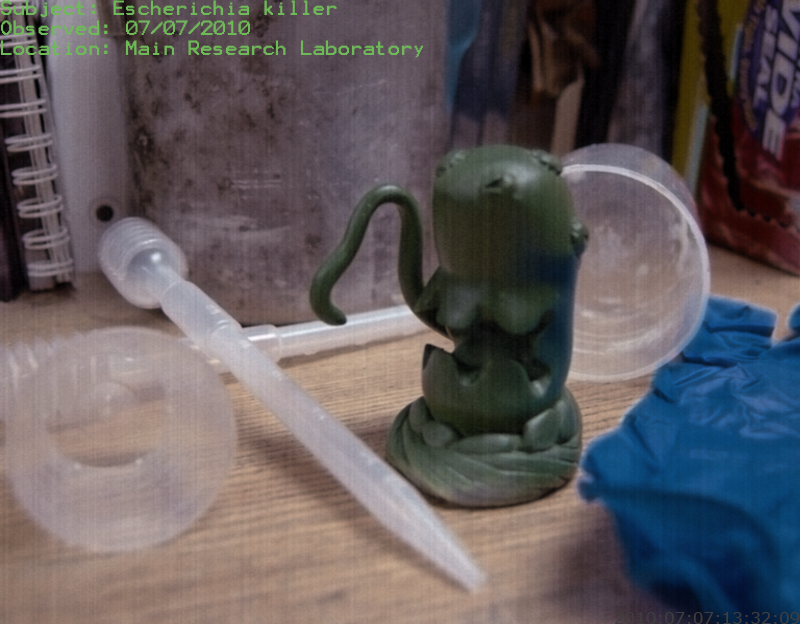 From the mutagen ATP-X birthing pools beneath the site of the lab, macrocellified pathogens have been launching their attacks on humanity, wreaking havoc wherever they appear! 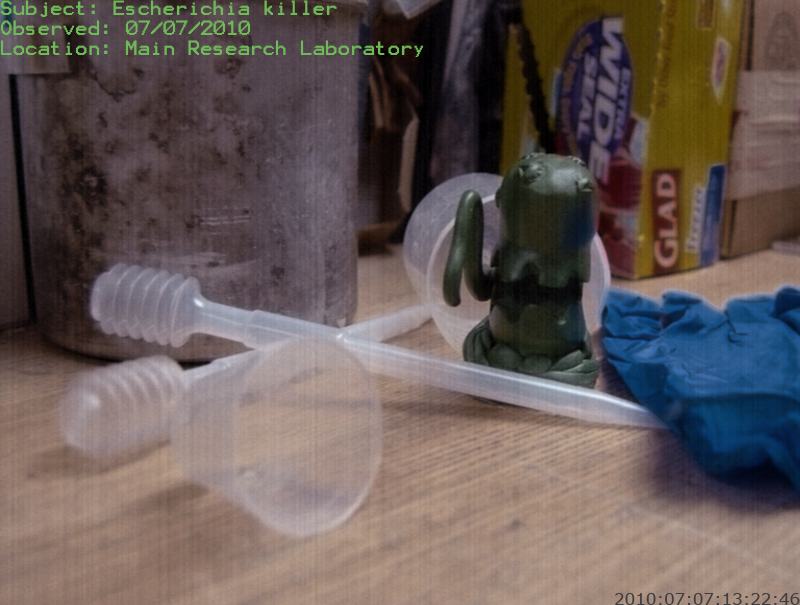 The first Killer Culture making its debut is the Escherichia killer, one of the front line and most abundant macrocell bacteria observed. 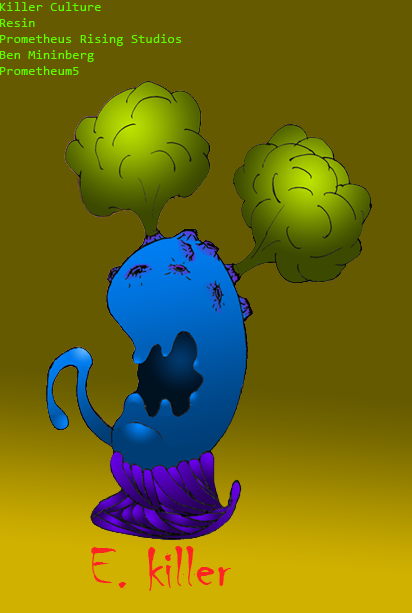 Armed with a crushing tentacle and deadly toxin transport proteins, E.killers exist only to feed and destroy. No antibiotic tried yet has been able to stop their deadly advance! 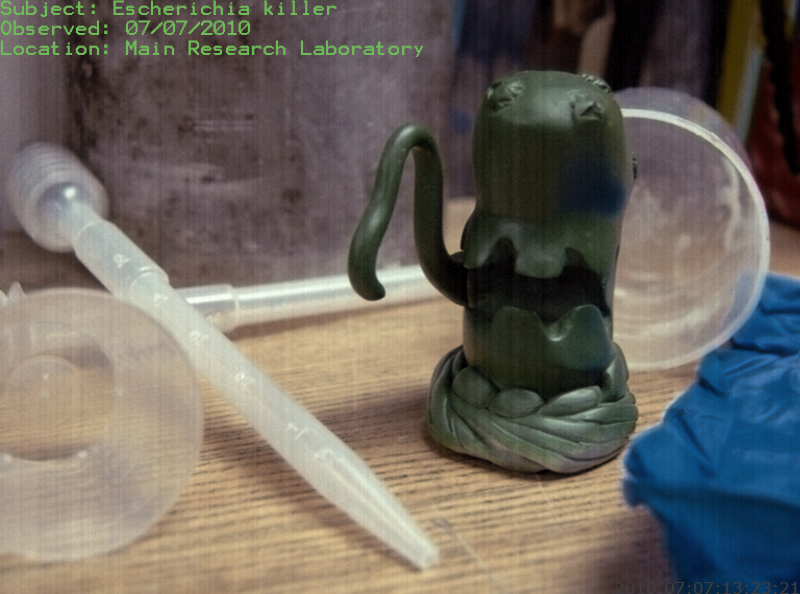 As the first figure in the line, E.killer will debut shortly in all his resin glory. The first wave is almost ready for paint, and more news will be coming.